"Burn-Off’ Brings Army RCO, SOCOM Together II. Test PNT Systems I. - The Americans .US! Having navigated to the top of a partially collapsed parking garage, an operator uses a dismounted device to check position and time. The scenarios for those demonstrating dismounted systems also incorporated a subterranean tunnel and multilevel jail. The technologies for dismounted service members included one that uses an inertial navigation unit worn on the foot and communicates with a smartphone via Bluetooth. RCO joins SOCOM in early assessments of new or emerging technology from defense industry, tech startups and academia. On a rainy afternoon in March, technology developers gathered to show their latest position, navigation and timing (PNT) solutions. There were no traditional marketing brochures, trade show booths or giveaway trinkets. Instead, these developers—from big industry, tech startups and academia alike—were there to demonstrate emerging capabilities and get feedback directly from the operators who may one day use the technology on the battlefield if their GPS is ever jammed, tricked or dropped. To carry out the event, organizers found a former Indiana state hospital, now a National Guard base with a 1,000-acre urban training complex that developers could use to assess their PNT technologies. They trekked through concrete subterranean tunnels, filled with several inches of water, weaving for 1.5 miles under structures that were both abandoned and still in use. They drove across rocky terrain, on paved roads with traffic circles and overpasses, and through mock villages. They navigated their way on foot through an old prison complex, a collapsed parking garage and a five-story hospital. A variety of scenarios brought the technology to life, providing the next step in assessing it beyond a PowerPoint presentation or white paper. 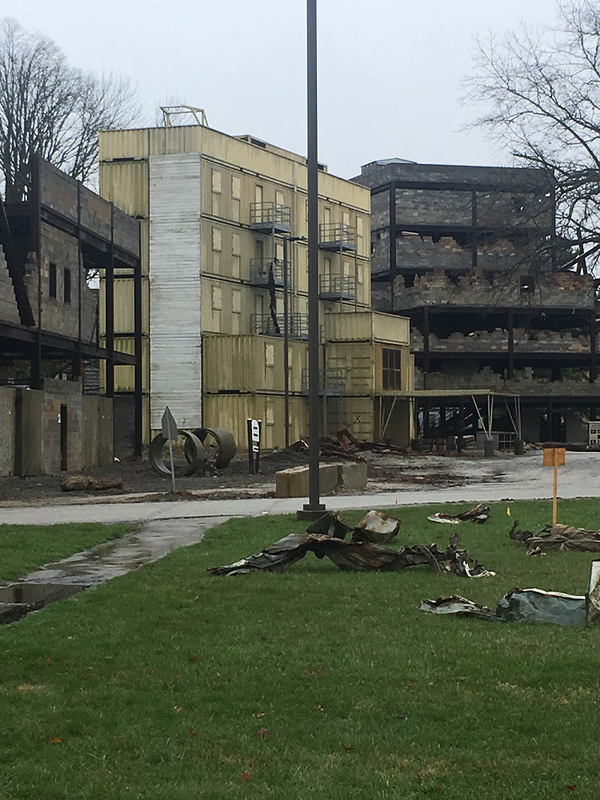 Among the more than 200 buildings, abandoned cars and rubble that make up the Muscatatuck Urban Training Center in Butlerville, Indiana, the Army RCO led the PNT portion of SOCOM’s Technical Experimentation 18-2, which took place March 26-29. While the RCO evaluated PNT technologies, the SOCOM event was much larger, evaluating such things as optics, biometrics, advanced sniper rifles and cognitive enhancement as well. The technical experimentations bring together the users, the program offices and the technology developers to evaluate promising new capabilities in a flexible, unclassified, operational environment. These events, which SOCOM holds a few times each year, allow for detailed user feedback and discovery of new or emerging technologies while also promoting information exchange and risk reduction. Mounted special operators drive through a village center at the Muscatatuck Urban Training Complex during the SOCOM-led technical experimentation event in March. The Army RCO was a partner in the event, assessing PNT technologies that operate in a GPS-denied environment. Nine technology developers participated in the PNT assessment with capabilities for both mounted and dismounted Soldiers. Falling under the Special Operations Forces Acquisition, Technology and Logistics Center, the technical experimentation events take place at military sites across the country. They focus on various technology areas of need, identified by the SOCOM service components and program offices. Having identified a need, SOCOM posts a request for information (RFI) for the experimentation event on the Federal Business Opportunities website. Anyone interested in participating simply responds to the RFI. After the event, the participating companies receive detailed assessments of how their technologies performed. “We treat everyone like they are our customers and we want everybody to go home satisfied, feeling like they got something out of it,” said Bernard. “We’re doing this early in the development process. So if there’s a company pursuing a technology and they get this sound bite from an operator—that can really help to shape their thinking. The SOCOM technical experimentation provided the ideal venue to host an initial RCO “burn-off” event. Both the SOCOM event and RCO burn-offs emphasize the value of bringing together commercial capabilities or emerging technologies in an operational demonstration to size them up against a set of criteria with a very low barrier to entry and without the pressure of a formal test. By being able to use the SOCOM event, the RCO can better prepare for its first solo burn-off, expected later this year. Technologies demonstrated during the PNT portion of the technical experimentation included radio-frequency range finding, atomic clock systems and inertial navigation unit technology. Each presented innovative ways to overcome jamming, which occurs when an adversary overpowers signals from GPS satellites so that receivers in certain areas cannot operate, and spoofing, or tricking a GPS receiver into calculating a false position. In the driving rain at Muscatatuck, mounted operators attempted to keep their vehicles on course without GPS while moving through various scenarios and settings. The different scenarios helped the Army measure technology performance and run comparisons, since one solution might do well driving around a planned course but drop in performance on a rough patch of road or an unplanned detour. Similarly, while a dismounted system could perform well for Soldiers climbing the stairs of a parking garage, it might not do as well within an enclosed concrete tunnel. Yet for a Soldier using the technology, all situations are relevant. To track the results, the RCO provided a GPS logger that recorded the ground-truth data to compare against the log files of the demonstrated systems. Additionally, they took distance and location measurements for the buildings and tunnels where GPS was not available. In all, nine developers participated in the PNT portion of the technical experimentation at Muscatatuck. They demonstrated technology that included, for example, a mounted device with a PNT-reliant system that can operate despite GPS disruption by using inertial measurement units and precision timing technology. The device combines PNT functions typically achieved through multiple independent systems. Another company demonstrated a dismounted system that uses an inertial navigation unit that users wear on the foot. It communicates with a smartphone via Bluetooth and uses robust algorithms to communicate during failures and dropouts. A third showed how three antennas prepositioned on the rooftops of nearby buildings provided triangulation to enable radio-frequency ranging for both mounted and dismounted operators. As the RCO uses different burn-off events throughout the year to determine if a new technology can be used to meet a specific need, it has gained important experience from the Muscatatuck event and anticipates partnering again with SOCOM. For industry, the burn-offs provide a chance to showcase capabilities and receive formal and informal feedback. For the Army, they yield a greater awareness of what promising new technology is available now and how it performs under different conditions. The PNT project manager and the Army Futures Command’s cross-functional team also participated at Muscatatuck to facilitate potential future capability efforts, which can help build unity of effort to enable faster, more streamlined modernization efforts. For more information on the technical experimentation events, go to http://www.socom.mil/sof-atl/pages/technical-experimentation.aspx. For more information on the Army RCO or its Emerging Technologies Office, go to http://rapidcapabilitiesoffice.army.mil/ or http://rapidcapabilitiesoffice.army.mil/eto/. NANCY JONES-BONBREST is a staff writer for Data Systems Analysts Inc., providing contract support to the Army Rapid Capabilities Office. She holds a B.S. in journalism from the University of Maryland, College Park. She has covered Army modernization for several years, including multiple training and testing events.